Air Coolers – CoolMaster CM8000 and CM23000 Air coolers and misting fans delivered in Dubai, Abu Dhabi, RAK, Al Ain and Sharjah. High power Cool Master evaporative air coolers and misting fans as well as commercial coolers and outdoor coolers available in stock. Details on our range below, multiple grades of evaporative air coolers, commercial Cool Master air coolers and outdoor coolers as well as misting fans available. Scaleable to suit your needs to ensure you only install what you require. 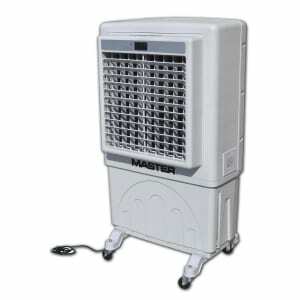 Cool Master Industrial Air Coolers are unique air coolers which are created only for industrial use in Dubai and UAE. These type of coolers are mainly used outdoors, perfect for restaurants, gardens and terraces. These coolers can be used all year round as well. Industrial air coolers are not like the regular air coolers as it will cost more to follow the traditional air cooler methods on a larger scale. Produces Fresh Air, Stale Air is not recirculated. There is no ozone layer Depletion as it is not refrigerant. Relatively low power consumption when compared with a traditional AC. There is no problem with rusting as all the coolers come with plastic body parts. You can forget that your employees will be affected by air pollution. Perfect Product for eco-friendly Projects. It consumes less amount of electrical energy. Industrial air coolers are highly durable. Coolmaster USA Evaporative Air Coolers are available in 8000M3/18000M3/23000M3 options. Misting fans delivered in Dubai, Abu Dhabi, RAK, Al Ain and Sharjah. 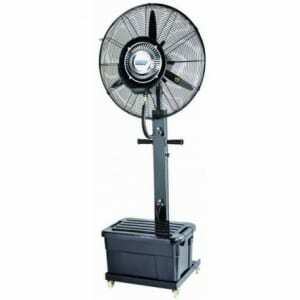 High power misting fans as well as commercial coolers and outdoor coolers available in stock. Details on our range below, multiple grades of evaporative air coolers, commercial Cool Master air coolers and outdoor coolers as well as misting fans available. Scaleable to suit your needs to ensure you only install what you require.